“`The capsule that took the first moon-walkers on their historic adventure is ready to embark on a road trip; its first tour of our nation in over forty years. 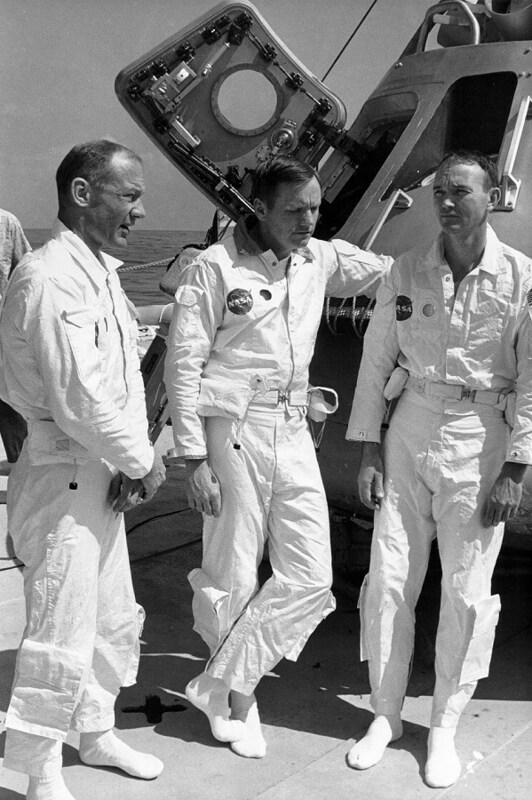 The Apollo 11 module is the spacecraft that Neil Armstrong, Buzz Aldrin, and Michael Collins (right) traveled to the moon in June, 1969. To celebrate their 50th anniversary of the achievement, the Smithsonian’s National Air and Space Museum is sending the spacecraft to museums around the country. It’s the first time Columbia will have left the museum since 1976. “`The traveling exhibit also includes objects, such as the helmet and gloves Aldrin wore during his moonwalk; a rock box the astronauts used to bring back some of the first samples from a heavenly body; and the watch that Collins wore during his lonely time orbiting the moon while Aldrin and Armstrong explored the lunar surface. “`The museums were picked for a variety of reasons, including that they had the capacity to display large, heavy objects. “`When it returns, Columbia will be the centerpiece of a new Destination Moon exhibit that will open in 2021, to tell the story of lunar exploration from ancient times to today. This entry was posted on Friday, February 24th, 2017 at 11:12 pm	and is filed under Blog by Manny Pacheco. You can follow any comments to this post through the RSS 2.0 feed. Responses are currently closed, but you can trackback from your own site.